The scarlet blouse beseeched her to take it home. And no protective arms of modesty. For maybe a moment in time, yes, just that. And judge her through the conditioned mirrors they bore in their hearts? In a bright scarlet sleeveless blouse. The vivid bearing of assurance that was so distinctly not brazen. Why not? She asked herself. And herself to the dankness of their imposed existence. Till one day she decided that she was going to be the Scarlet Queen. That had been lying ignored. that she had never worn before. And ruled it disgraceful any crossing of standardized thresholds. Especially if it involved married women. Rightfully shirtless as ever, leching at passing femmes. Disapproving the improprieties of society. Their bored expressions lit up when they saw her. She had given them food for talk. Called out loud to her. She pretended not to have heard but walked on. The saga in scarlet marched on, unfazed by the stir she was causing. None of it mattered to her, anymore. She discovered she was poetry. A name as per the astrological charts confirmed. Was something beyond the aesthetics. Not just of the intellect but even beyond. My mother, whose name meant 'achievement'. The grand-elders deemed it sacrilege. “Remember what you are now. What have you achieved here but the kitchen!" My father, a shadow till then, spoke out loud and clear. “She’s my daughter and I shall name her what I will. that gave me my name. 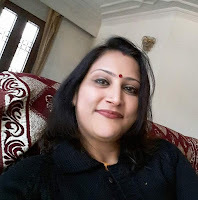 Vidya Shankar is a poet, writer, blogger, motivational speaker, English language teacher, instructional designer, content developer, and yoga enthusiast. Like a bamboo taking its time to grow, so has she waited, patiently, for her time to come to live a life of purpose, having broken the invisible shackles of an outdated society. An active member of poetry circles, Vidya’s works have appeared in national and international literary magazines, literary platforms and anthologies. She had been a regular contributor for the column 'Short Take' published in 'The Gulf Today', a Sharjah-based newspaper for over five years with over 250 articles to her credit. Her first book 'The Flautist of Brindaranyam', an anthology of 12 poems, is a collaborative effort with her photographer husband, Shankar Ramakrishnan. It was published in December 2017. Vidya is currently working on her second book — a collection of some of her Short Take articles.